Pro. 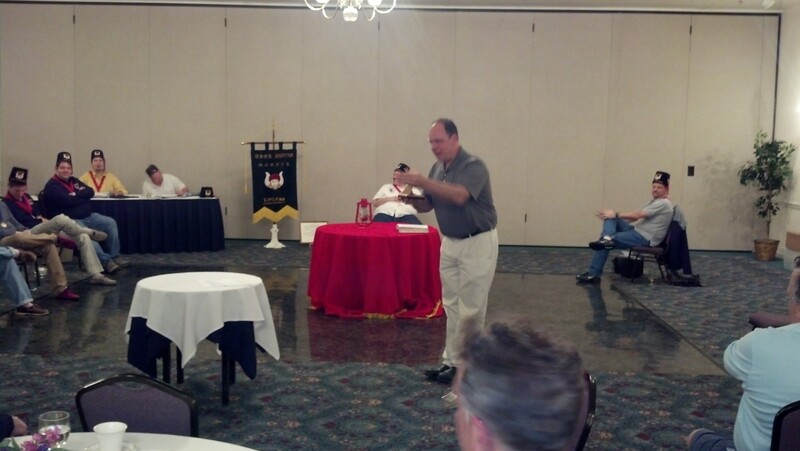 Andrew “the Auctioneer” Sterling drives the bidding for the Grand Master’s Medallions at our latest meeting. On Sunday, April 28, 2013, Ubar Grotto held its first Convivial Meeting of the year. “What’s a Convivial Meeting” you ask? Well, each member of Ubar pays in to a Convivial fund as part of his dues. Then, twice a year, the Grotto picks up the tab for the meal. Pretty sweet, right? The meal for this meeting was thick cut Prime Rib along with lots of sides and goodies. Many Prophets wondered what kind of prehistoric beast was cooked up to offer such massive slabs of meat, but everyone was very pleased with the meal. The meeting itself was the normal, jovial affair that everyone has come to expect from an Ubar night. Close to 50 Prophets (which accounts for nearly 2/3rds of the membership) were present! The Prophets were especially generous is authorizing care packages and Enchanted Lanterns for two sick members. More information on that will be posted in coming weeks. The members were also generous near the end of the meeting, when two PA Grand Master’s Medallions were auctioned off. Pro. Andrew Sterling acted as the quick tongued auctioneer for the evening. The bidding was intense and the numbers rose quickly. The first medallion went for $140, while the second one went for an astonishing $175. To top it off, several members purchased copies of the “Ubar Still Life” print, bringing the evening’s income to more than $350! The Monarch wishes to extend his heartfelt thanks to the Prophets for a great evening of food and fellowship. Ubar has some big plans for the summer and fall, so make sure to check your notice and keep an eye on this website!